There were a few glaring features missing, but the last build was mostly complete functionally. I’ve since been working on getting the game to feel much more polished. The prototype system used for unit configurations was changed to be far more flexible and will work more like CSS, where “technologies” (classes in CSS) have various selectors which determine which entities they are active for. 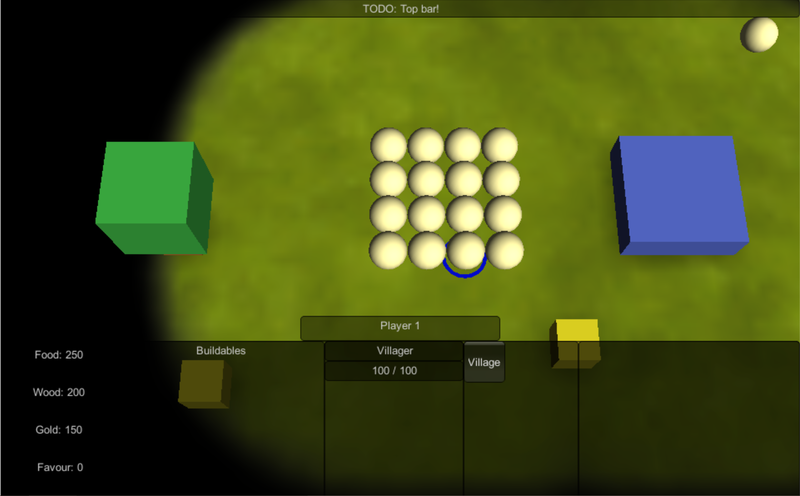 Fields are overwritten in the same way, but a single units prototype can be spread throughout the file; the end result is that it is now easy to add upgrades that can have a significant effect on the game. A game will obviously have a lot of projectiles (arrows, priest attack, etc. ), which all act very simply. Theres now a special subsystem dedicated to handling projectiles in a much more efficient way than creating a new entity for each projectile. They are rendered and (soon) animated with the same prototype configuration as normal entities. This one is a much more substantial feature addition. The game now has a minimap which rotates with the camera and shows/allows movements of the camera frustum. I may look in to dirty sectioning for it later, but the draw overhead is so minor that it probably doenst matter that its O(n). The game now tracks a separate list of entities which need to be updated each frame, which is only units tasked with a command. It is possible to reduce this to only units which have a move command, but the current method is likely fast enough. 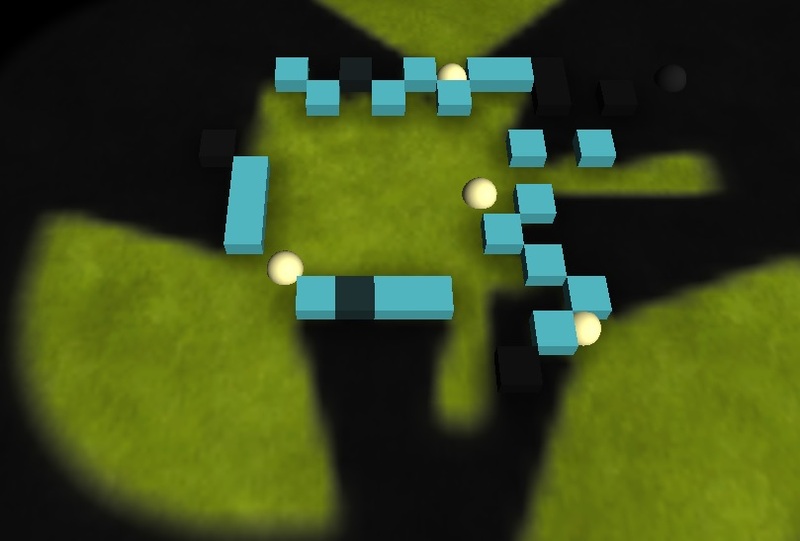 The game also has an EntityMap, which tracks nearby groups of entities (white boxes in the image below). Entities will delay repathing when given a new target until required. Loading is still too slow for my liking; it takes 80ms to parse the prototypes and 550ms to instantiate entities in the current demo map, but optimisations come later! EDIT: Oops.. I still had some testing code in there; instantiating entities takes 50ms now. Was working well previously, but some of the newer optimisation and validation changes have probably broken things. Dont expect this to work terribly well until nearer to release. The previous tutorial series covers most of the basics for an RTS. I probably wont be doing any others for a while as I’d now like to concentrate on RTS4. There has been some quite significant progress made to the project; with the cleaner design from the UnityRTS tutorial series, and the separation of simulation from visuals, the project is much easier to work with now. In the UnityRTS projects, although updating happens at a fixed time interval, the coupling of the simulation and visuals makes it difficult to have simulations running in the background and ties the game more closely to the Unity engine (which with Unreal looking so nice, I want to avoid). These two functions are now separate, and each client now runs two simulations concurrently; one for the last known server state, and one for the clients visuals. Each network message is first run on the server, if it is prior to the clients visuals simulation time, the client sim is synced to the servers sim, and then rolled forward to the correct client time. This gives clients no lag while still minimising network bandwidth. As the visuals are separate to these simulations, they can smoothly interpolate whenever the client simulates incorrectly. The decoupling of the simulation from the Unity visuals means that entities can no longer be described by components on a prefab. 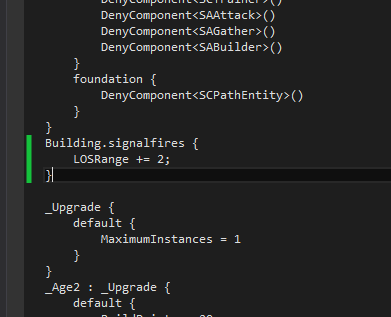 To replace and extend this system, each entity now has a prototype object, which calculates any stateless properties (its max health, build time, etc.). Getting a field is not as simple as looking it up by name; Prototypes have a list of technologies which can be enabled or disabled which augment fields, enable / disable components, and even enable / disable other technologies (both for just this entity, or for all entities owned by the player). 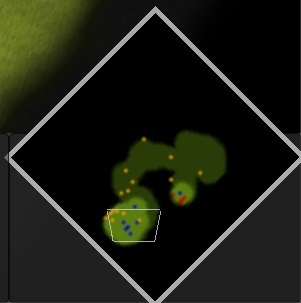 These toggleable technologies mean that entities can very simply support buffs and debuffs, by for example enabling a SlowPoison technology. The system also handles armoury upgrades by enabling the HardenedShields player-wide. 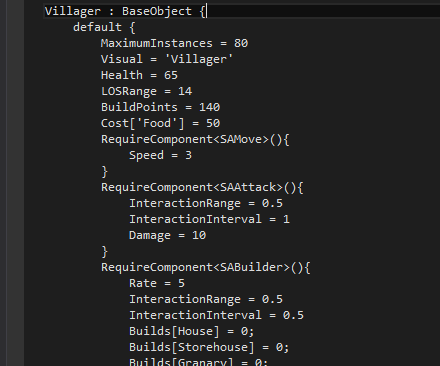 And it can even be used to handle tech unlocks, for example by enabling age2 player-wide, which can in turn augment the villagers Builds list to include Barracks and Farms. I dont fully understand the effects system in AoM, but this seems more extensible and quite happy at how many common RTS concepts it can support cleanly. None of my previous attempts included anything like this, so its great to finally understand it. With the changes above, multiplayer is now functional. I’m using the RPC support in Unity to send messages (after serialising them to byte arrays) which conveniently handles lobbies and NAT punchthrough for me. The current version can be played here (with multiplayer disabled at the moment). I also added in the older models instead of boxes. Although promised many times, Unity still does not have a decent UI layout engine. The process can be simplified with NGUI from the asset store, but its still tedious. For UnityRTS I opted to use a system similar to the built in GUILayout, but tried to make it much simpler to use for common use cases. It works off of a loose hierarchy of elements, with three main functions. Most of the time, child elements will borrow a slice from their parents; removing that space from the parent and giving it to the child. This is done through WidthSlice() and HeightSlice(). Another common function is tables and grids, created through the Grid() function. After specifying the number of rows and columns, calling Cell() on a grid returns the next cell (iterating horizontally then vertically). The final function is a flow layout, though not integrated as nicely as it could be. This scales down items uniformly to fit the specified number of items in the allocated space; much like grid, but the item dimensions and count are provided, and item aspect ratios are preserved. Its been a while! This time I’ve made a lot of tweaks to the Line of Sight code so that items can correctly and efficiently occlude unit vision and implemented pathfinding using flowfields for smoother unit motion. Both items took quite a bit longer than I had anticipated and are probably still quite slow, but I’m happy with how they are looking. This post will talk about the vision blockers; I’ll leave pathfinding for the next. Some code existed in the previous build for entities to write their blocking height to a grid covering the game world. This grid tracks the highest unit on each cell and blocks sight for all shorter units. The RevealLOS method has been rewritten to now more accurately read this data and project “shadows” outward to hide areas of terrain. The algorithm has two distinct phases. The first pass iterates through all tiles within the reveal radius, ordered by their occurrence when sweeping clockwise. Think of this as a radar, which pings for each cell as the detector passes them. This ordering is important to keep the input clean and reduce the amount of work needed later. Each cells height is compared against the current units height, if the cell is too high, it is added to an ordered list of blocking cells (ordered the same as the iteration, clockwise around the unit). The distance and angles for where the blocked vision starts and stops are also cached. A small optimisation pass is done on this data to remove cells that are eclipsed by other cells nearer to the unit center; these are redundant, since any terrain they occlude will already be occluded by the nearer cells. The next pass iterates over all tiles within the reveal radius, determines their distance and start/end angles, and looks through the previous list of occlusion cells to determine how much of the tile is occluded. As the occlusion items are ordered, iterating this list forward and shrinking the visible arc is sufficient to correctly calculate occlusion for the left-most angle. This is then repeated in reverse for the right side. The result of this calculation is four angles; the tiles initial start and end angles relative to the unit, and the unoccluded start and end angles. The visibility of each tile is simply the unoccluded arc size divided by the total tile arc size. Trigonometry functions are expensive to execute, so “angles” here are approximations. A full circle in this system is 8 degrees, and calculating the angle of a vector is simply determining what quadrant it is in, and then dividing the coordinates. It is impossible for the arc of a nearer cell to be smaller than a farther cell it is projecting onto. If this were not the case, it could be possible for small arcs to lie entirely within a tiles arc, and be ignored by the system.